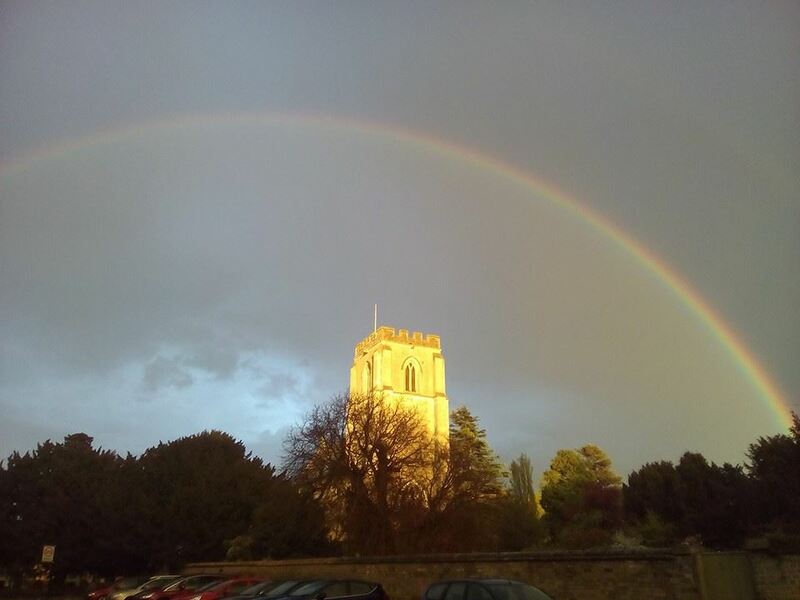 Rainbow over Trumpington Church (Photo by Sam Gorman) The Parish Church for the village of Trumpington, near Cambridge in the Diocese of Ely, is dedicated to Saints Mary and Michael. Here's a map to find it. OS Map Reference TL 443549. Note there is a one way road system from Maris Lane to Grantchester Road. 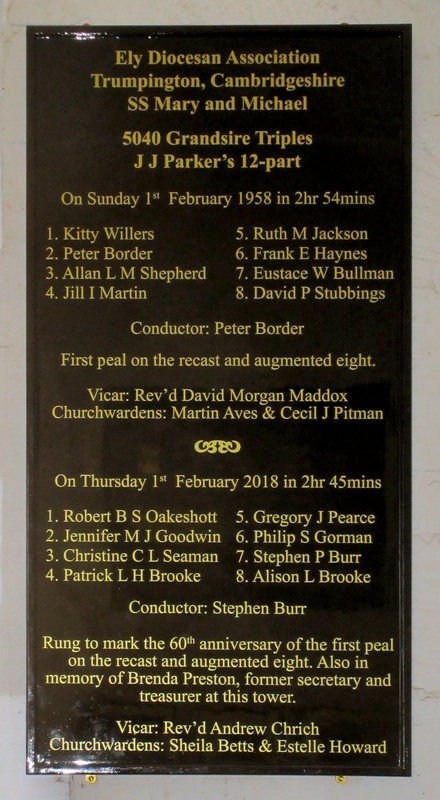 The bells are rung on Sundays for the morning service and Evensong (see times below), on Wednesday evenings for practice, and for weddings and other special occasions/services. There is sometimes a peal, quarter peal, training event or ringing by visitors at weekends. Its tower houses a glorious ring of 8 bells cast by John Taylor & Co (Loughborough) in 1957. The heaviest (tenor) bell weighs just over half a ton (10-2-22 cwt, 543 kg) tuned to the note G. Here are the detailed Weights, Notes and Inscriptions of the Bells. 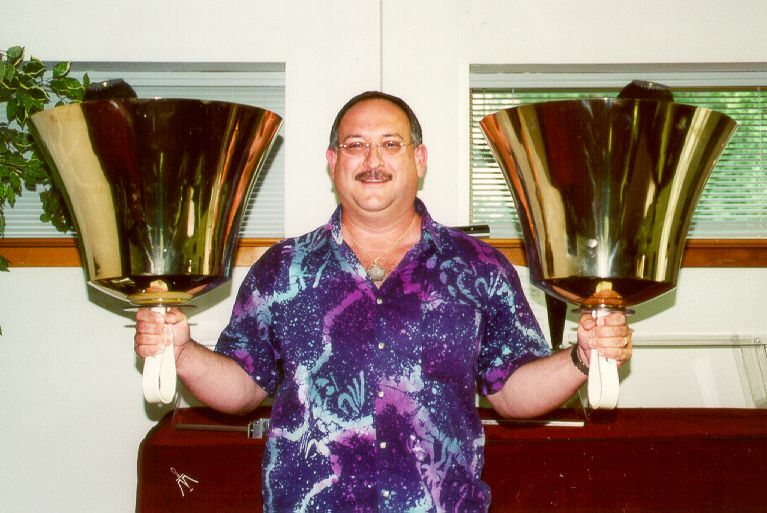 The bells were recast and rehung with new fittings in an extended frame with two additional trebles to form an octave in 1957. The 50th anniversary of the bells was celebrated in 2007 with some special ringing. There are actually 9 bells hung in the tower - the late medieval 5th bell of the old six, cast at Bury St Edmunds circa 1450, is hung for tolling as a Sanctus Bell above the others. The original 5 bells in the tower were augmented to 6 in 1928, with the addition of a new treble, all hung in a new oak frame. The organ loft, made from the old frame, was dedicated by the Archdeacon of Ely in 1929. Sunday Service ringing is from 9:30 to 10:00 a.m for Morning Service, and from 6:00 to 6:30 p.m for Evensong. On Sunday evenings there may sometimes also be a quarter peal attempt at 5:00 p.m, prior to ringing for Evensong. Practice Night is Wednesday from 7:30 to 9:00 p.m. Visitors welcome! Early teaching sessions start at 7:00 p.m. Weddings and visiting bands by arrangement with the (Vicar) and Secretary. Kitty Willers was a remarkable woman. She began ringing at Trumpington in 1918, and served as Tower Captain for 56 years until 1976. In 1924 she became the first lady to conduct a peal for the Ely DA. She was instrumental in getting Trumpington bells augmented to an octave in 1957, and donated two treble bells to help achieve this. She taught numerous people to ring, and many ringers still remember her, her endeavours and her interesting character. We have collected some people's reminiscences and lots of photos together at Kitty Willers - An Appreciation, By the Bellringers and Friends of Trumpington Parish Church. rung by the Society of Cambridge Youths at Trumpington in April 2004. Its development is described here. This beautiful double peal board now hangs proudly on the wall in the ringing chamber. It marks the 60th anniversary of the first peal on the new bells back in 1958, and was also rung in memory of Brenda Preston. It was made by Brian Pratt from Fen Ditton, whose wife Jill (nee Martin) rang in that first peal. We again welcomed the New Year in our now traditional fashion, with a date touch of 2019 changes of Yorkshire Surprise Major on 1st Jan 2019, our 11th consecutive date touch! 27th Jan 2019 - Quarter Peal for Evensong - Jenny's 200th!